Yeah, you really nailed that one. Great film, amazing music and cast. I'm glad you included this in your 2500 list. @Matt: Thank you, sir. I appreciate that. This is a movie I grew up on, and I really enjoy watching it. I know there's been talk of a Blu-Ray release somewhere down the line (there's even an Amazon link to one, i believe), but as of today no official announcement on a date. A nostalgic look back at the long lost era of the early 1960's car cruising teenager culture. 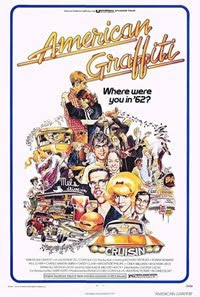 Richard Dreyfuss, Cindy Williams, Mackenzie Phillips, and Paul Le Mat shine among the ensemble cast. Thoroughly enjoyable coming of age film, and a great addition to the 2,500 movie challenge. Jill: Couldn't agree with you more...this is a fun, touching film and a great time capsule of a movie. And I have to say I really like how you're going back to the earliest days of this "project" of mine! It seems like forever since I've seen these movies, and I'm happy to be discussing them with you. Thanks for all the support, and have a great day!